Between five and seven million companion animals enter animal shelters every year, according to the ASPCA, and three to four million are euthanized. ePromos wanted to help, so we took action with what we do best: promotional products. When the Tri-County Humane Society (TCHS) near our headquarters in St. Cloud, Minnesota, hosted its 11th annual Wine, Kibbles and Bids event, we jumped at the chance to sponsor this fund-raising event. It just made sense, according to Cydney Reuter, a sales manager for ePromos who also happens to be the 2012 board president for TCHS. 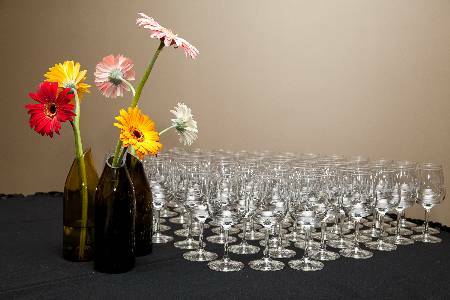 As guests were ushered into the beautiful Gorecki Center at the College of St. Benedict, they received custom wine glasses to use throughout the night for various wine tastings and also at the open bar. ePromos’ marketing coordinator, Libby Defries, also attended the event, and noted that the custom wine glasses were well-received by attendees. “It seemed everyone in the room had one,” she says. The custom wine glasses were useful as guests sampled various wines, mingled and explored different items in the silent auction. Wine accessories are always a great promo idea. And because the custom wine glasses featured the logo for the Tri-County Humane Society, they made lovely reminders of the event that guests can use at their own dinners and gatherings. Promo know-how tip: Promotional products are a great way to enhance your audience’s experience at charitable events. Just consider the activities at the event, and choose custom products accordingly. The promotional products should have a clear tie-in to the cause or the event. We can help you pinpoint the perfect way to spread your message with promotional products. Edited September, 2018 with updated website links. I am very intrigued with the way ePromos brand products, campaigns and the like! I commend ePromos and the whole concept of wine glass as a charity memento! It’s classy and at the same time a perfect tool for integrating wine tasting at the same time promoting TCHS. You can never have enough wine glasses and it’s for a great cause! Thank you for your generosity ePromos! The wine glasses were a beautiful touch to our elegant event, and the guests were thrilled to be taking home such a nice gift.